<?xml:namespace prefix = st1 ns = "urn:schemas-microsoft-com:office:smarttags" />Strata Park is the modern system application for today�s open plan office environment. At the heart of the Strata Park concept is the ability to bring nature into social areas within a working environment. The ability to custom design your own park is made easy with a variety of standard components that allow you to mix and match with the additional option of incorporating seats and tops so that your Strata Park makes the most of your space. Complete with designer looks and functionality, the real beauty is no doubt in its flexibility � from large open spaces to smaller office areas, Strata Park offers escape from the everyday pressures of your working environment. Apart from the general stacking ability of Strata Park, unlimited lengths can be achieved if you design using the brick stack system. Serious lengths can be achieved so you get all the benefits of plants in your day to day interior workspace. Design a park that perfectly fits your space! With modern businesses realising the many benefits of creating greener work environments, the flexible nature of Strata Park makes this just as easy as a walk in the park. increased productivity and wellbeing, as plants improve air quality and add a sense of balance. 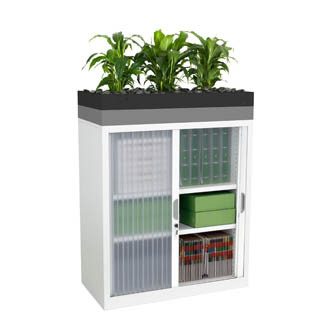 The Strata product range includes a planter box system called Strata Planter which, when integrated with Precisions Smartstore� cabinet, merges the benefits of greenscaping with the performance of cleverly designed storage spaces.